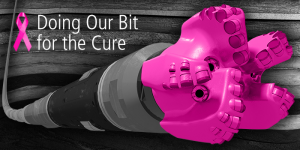 File this under “you can’t make this sh*t up”: Susan G. Komen has partnered with Baker Hughes, a leading global fracking corporation, to distribute 1,000 pink drill bits “for the cure.” This “Doing Our Bit for the Cure” partnership is a classic – and egregious – example of pinkwashing. Baker Hughes and Komen claim to care about breast cancer, but at least 25% of chemicals used in fracking increase our risk of cancer. So why is the largest breast cancer organization in the world partnering with a corporation that is increasing our risk of cancer? The response to this ludicrous pinkwashing partnership has been swift and furious, and the drumbeat for Komen to stop pinkwashing grows louder every day. Our national anti-fracking partners have joined us in launching a petition to Komen and as a result over 100,000 people have demanded that Komen stop this pinkwashing. The media has been all over it – we’ve gotten extensive media coverage, including in NBC News, New York Magazine, Mother Jones, The Philadelphia Inquirer, and NPR affiliate WHYY Philadelphia. TAKE ACTION: join over 100.000 people who are demanding that Susan G. Komen stop their pinkwashing partnership and pay attention to the health harms of fracking. On October 1st, we launched a sweeping critique of pink ribbon marketing and culture as well as a positive alternative vision for what we need in the breast cancer movement. Komen’s pinkwashing partnership with oil & gas giant Baker Hughes is an insidious example of corporate profits and partners coming before women’s health. This is unacceptable – our health is not for sale. We’ll be delivering this petition to Komen next week, so take action today. And help keep the pressure on by forwarding this important action to your friends.